Subscribe to comments with RSS or TrackBack to 'BBWAA award post-mortem; are the writers finally getting things right?'. Well, “always” is a long time to expect a supermodel to stick around . . .
Porcello had six more wins than V, five few losses, and his team made the playoffs. Game over in most writers’ minds. In NL Cy voting, I was glad that Max won, but I was surprised at the lack of support for Thor and Jose. They were the 1-2 pitchers in baseball by fWAR, followed by Max, then Cueto, who finished 6th in the voting . . . ahead of Jose and Thor. Incidentally, Roark got a 5th place vote, which placed him 10th. I already made my case for Murphy over Bryant. Murph led him in nearly every batting category except HRs and runs scored, and Murph meant more to the success of his team. Yet somehow, Bryant is widely acclaimed at the best player in the league. He may be, but it isn’t as much of a slam dunk as everyone seems to want to make it. There are many arguments both ways on Trout and Betts. Trout was slightly better, but on a much worse team. Of course the Halos probably would have been pushing 100 losses without Trout. I didn’t think that it was possible for me to appreciate Kate Upton more, but I stand corrected. 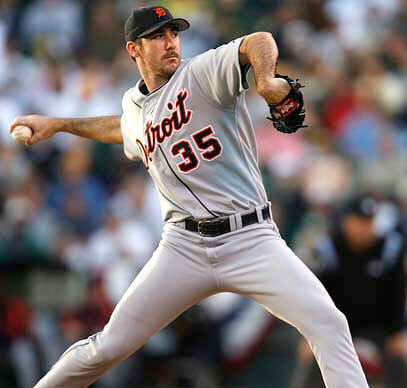 Although to be fair it’s possible that Verlander would have finished behind Porcello even if he had been on the other two ballots – it’s my understanding that if Verlander had added a 3rd and 5th place vote (for example) then he would have finished one point behind Porcello. I had no particular problem with Fulmer winning RoY, he was a worthy candidate. But I think it’s unfair to write off Sanchez’s candidacy as solely because of NY hype. Yeah, Sanchez played only 53 games, but put up 3.2 fWAR and 3.0 bWAR in that time. He not only had a record setting power bat, he was a really good defensive catcher. Fulmer had an fWAR/bWAR split (not unusual for pitchers), finishing behind Sanchez at 3.0 fWAR but ahead of him with 4.9 rWAR. So by one objective measure (fWAR) Sanchez’s impact in 1/3 of a season was graded higher than Fulmer’s impact over a full season. It would have essentially been a situation equivalent to giving a player who finished short of the required number of plate appearances to qualify for a batting title the nod if he would have still been ahead if you add enough at bats to have qualified. It’s not hype to say that Sanchez was amazing over 1/3 of a season; his impact was essentially Troutesque, and he almost single handedly kept the Yankees in the postseason conversation well into September. Yes, Fulmer was deserving. But it certainly wasn’t a slam dunk, and Sanchez’s argument (for me) passed the straight face test even though it wasn’t ultimately a winner. I dunno, I still haven’t completely forgiven Kate for that SI cover with the other Uptons, Justin and the Artist Formerly Known as B.J. . . . The party’s at Marty’s: Skole got his 40-man add, along with Voth, Marmeljos, Bautista, AND Read. Seems like some unnecessary packing of the 40-man to me. Detroit might well have won the WS this year had they elected to bite the bullet and pay Scherzer instead of going the cheaper route by ultimately signing Z-nn. What a one-two punch that would have been. I mentioned this over at NP–but I’m attending Minor League Baseball’s annual health fair at the winter meetings this year as a representative volunteer manning a table for the American Cancer Society. While I’m there, I’m hoping to get a chance to wander around a bit on the big league side of the meetings. Maybe I’ll get to say that when they made the historic Chris Sale trade, I was there. You mean the historic Chris Sale trade . . . to the Dodgers? Sounds like we may need to look a little harder for some RH bats . . .
Actually, the rumor that the Dodgers are interested in a mega-deal for Sale, Frazier, and Robertson is a reminder of how thinned out the big-bucks Dodgers are right now. Their #2 starter, biggest RH bat, and stud closer are all free agents, and they’ve already lost Reddick and traded Kendrick. I still expect them to field a contending team, possibly with Hill, Turner, and Jansen all returning, but this scenario points out how much work they’ve got to do to maintain their status. Its amazing to me how thin the Dodgers are considering their payroll. Here’s their cots page: $249M in payroll in 2016. They already have $180 committed for 2017 to just 12 players. I read during the playoffs that the Dodgers were still paying $114M in 2016 to FORMER players. That’s just a staggering stat. A couple mention the Nats’ potential interest, but the consensus is that they’ll keep him. They think his offense will mostly rebound, but probably not the defense. That Dodgers spending spree is based on the insane amount of cash they received for their cable TV rights–which subscribers have to pay to their cable companies whether they want to watch Dodgers games or not. At some point the cost of cable TV is going to reach the point where many subscribers are not going to be able to pay it anymore, and those deals are going to become a huge bubble that explodes rather than pops. Also keep an eye on MLB attendance next year. This year it dropped overall by 447,000 (about 0.6 percent). Doesn’t seem like a lot, but that also includes all those tickets owners basically give away to boost the numbers (Red Carpet Rewards, anyone?). If attendance drops again next year, it is likely indicative of a sport that is starting to price itself beyond the means of the average fan, with serious potential repercussions for any team caught out with an enormous payroll based upon revenue projections that go right up in smoke.